Getting started with agile: When you’re an Agile newbie, you have to start somewhere. We’ll explore how to get started. All the methodologies: Scrum, XP, KanBan, Sprints, Stand-ups, Velocity… Eeks. 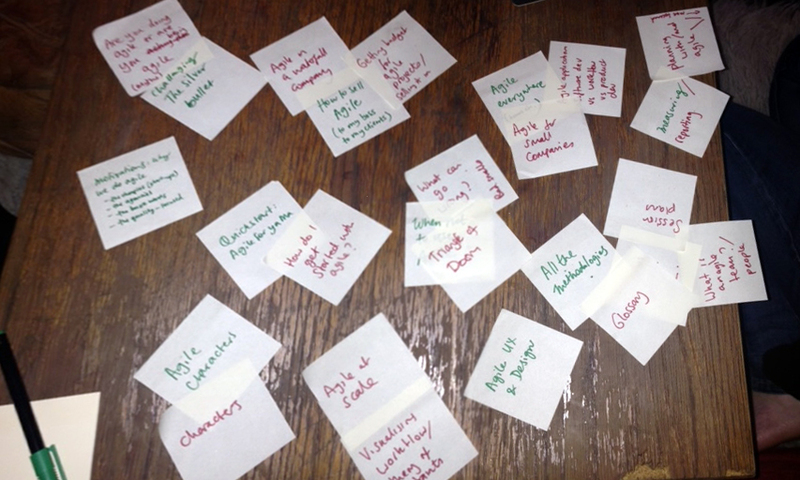 What do all the Agile terms mean? Which term belongs to which methodology or is it just a buzz-word? Agile Everywhere: Using Agile outside the world of software development to manage your project or even your household. Agile characters: The good and the bad folks you’ll meet along the way and how to get through. How to sell Agile to your boss and to your clients: We’ll help you convince others that it’s a good idea. Why people do Agile: We’ll explore the motivations and the reasons. Because it’s cheaper? Because it’s less risky? Because all the cool kids are doing it? Because you get a better result? The poll is now closed. The results are over here. In our next post, we’ll announce our first Minimum Viable Book chapters and our first 4 workshop dates. Exciting!